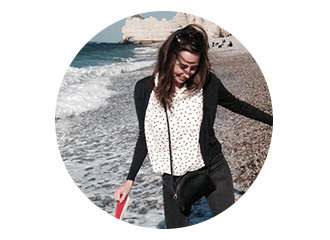 Felix and I went to the Cinque Terre in January, and we couldn’t get enough of this. Ate it every day, and brought back loads of trofie only to find that we could buy it here. Do yourself a favour and make this tonight. Bring a large pot to boil, and put in the potato chunks. Put the potato chunks into a large saucepan together with plenty of salt. Cook the potatoes until tender, about 10-15 minutes, then add the pasta and the green beans. Check the packet cooking instructions. While this is cooking, blitz the ingredients for the pesto with a hand blender. 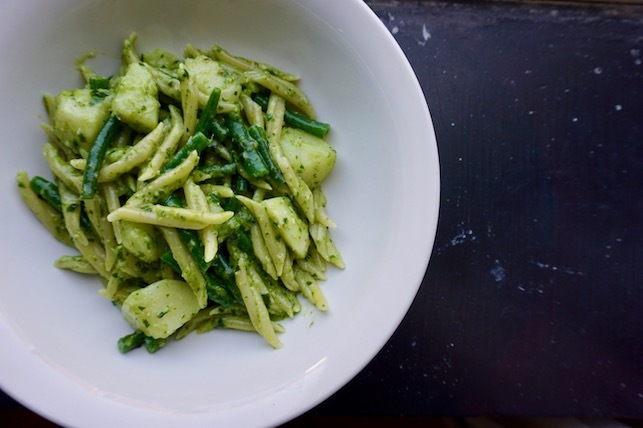 Pour the drained potatoes, beans and pasta back into the dry pan, and add the pesto. Give it a good stir and if needed add a bit of cooking water. Garnish with a bit of basil and serve immediately. This is so healthy and satisfying. 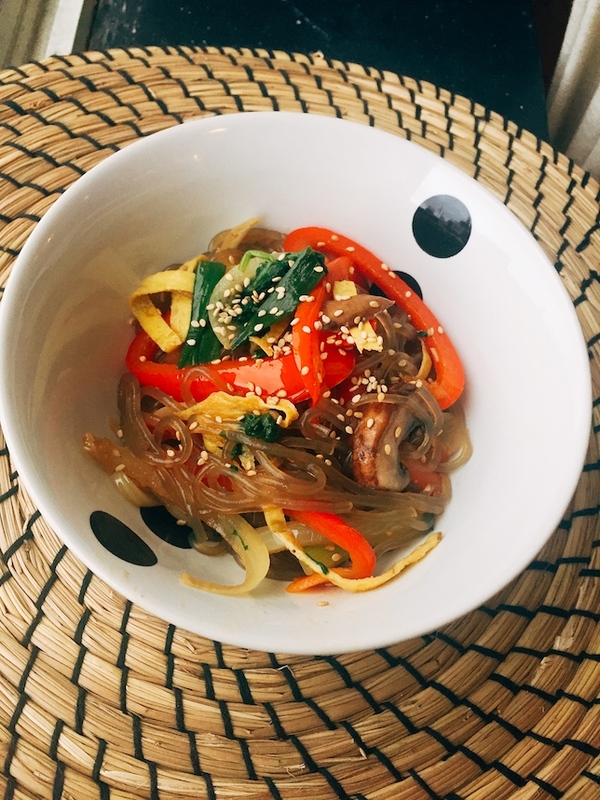 The noodles are chewy sweet potato noodles, which you can find at asian stores. Normally this should be made with beef or tofu, but I think the version with just vegetables is equally delicious, and a bit easier. The concept is that you cook each ingredient separately so that each one maintains its taste and the sum of the parts is positively delicious! 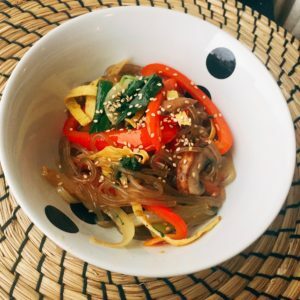 My Korean cooking inspiration is Maangchi, who has wonderful videos and writes great recipes, go check her out!! First, soak your noodles in cold water. To prepare the spinach, put a pot of water on to boil. In the meantime, make the egg: beat an egg with a pinch of salt. Add vegetable oil to the pan, and use a paper towel to wipe off any excess- you want only a thin layer. Pour the egg into the pan and tilt it so that it spreads out as evenly as possible. Turn off the heat and let it sit for a minute, then carefully use your fingers to flip it over and let it sit on the pan for 1 more minute. Let it cool and slice it into thin strips. The water for the spinach should be boiling by now. Add the spinach and let cook for 1 minute, then take it out with a slotted spoon or strainer. Rinse the spinach in cold water to stop it from cooking. Squeeze it with your hands (or ideally cheesecloth) to remove any excess water. Cut it a few times and put it into a large bowl. Mix with 1 teaspoon soy sauce and 1 teaspoon sesame oil. Put another pot of water on to cook the noodles. As you wait for it to boil, chop all your veggies as outlined above. Once ready, heat your skillet up over medium high heat, and add a glug of vegetable oil. Stir-fry the onion and scallion with a pinch of salt for about 3-5 minutes. Remove from the heat and transfer to the bowl with the spinach. Start again with a glug of oil in the pan, and cook the mushrooms with a pinch of salt. Stir fry for 3-5 minutes and transfer to the large bowl. When your noodle water is boiling, cook your noodles as per package instructions (8 minutes or until chewy but cooked). Remove from the water, strain with water, and cut them a few times with scissors. Put the noodles into the bowl, add in 2 teaspoons sesame oil, 1 teaspoon soy sauce, and 1 teaspoon brown sugar. Mix with a spoon or your hands. Heat up the skillet with oil again and cook the carrots for a few minutes before adding in the red pepper. Cook for another 3 minutes and then transfer to the noodle bowl. Now you have all of your ingredients cooked separately and in the bow. Add 1 minced garlic clove (if you can handle it raw! ), 1 tablespoon soy sauce, 1 tablespoon brown sugar, ½ teaspoon ground black pepper, and 2 teaspoons of sesame oil to the mixing bowl full of ingredients. Top with the sliced egg and sesame seeds and serve. In retrospect, this wasn’t a weeknight meal. This wasn’t a 30-minutes to the table smash. but it was a big hit! So perfect for a Monday night when you have a bit of extra time. 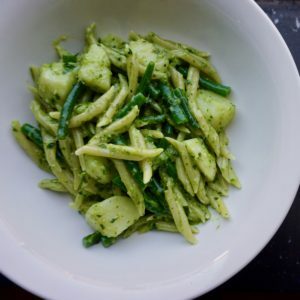 The main sell here is that it feels like a decadent pasta dish, but in reality it’s made from chickpea flour, and packed with spinach, so nothing to be ashamed of!! Make the crespelle batter: In a medium bowl, mix together the ingredients, and leave to sit for 20 minutes. In the meantime, get the sauce on the stove: chop the onion and the garlic, sautee with olive oil for 5 minutes, sprinkle in the herbs and then the tomato passata and diced tomatoes. Let it bubble away on a low heat while you keep working. Prepare the filling next: Combine all filling ingredients in a large bowl and stir well. 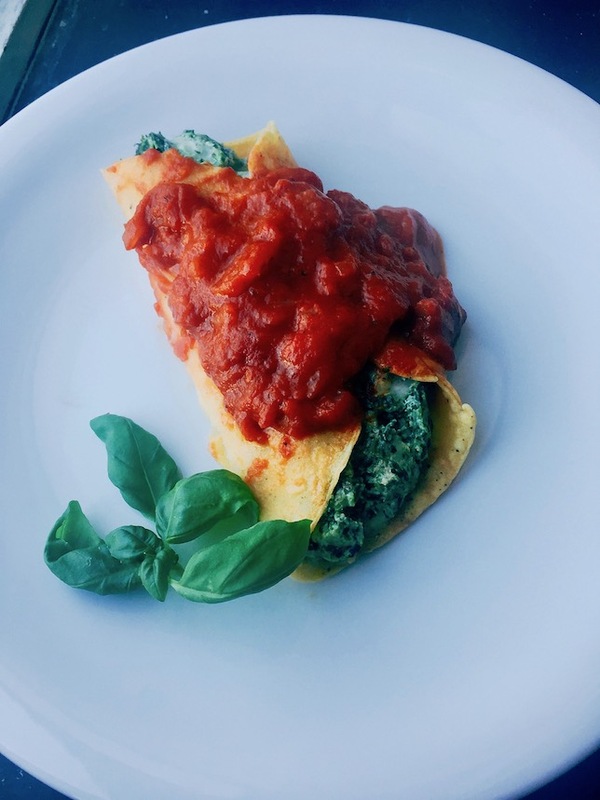 Getting all of the water out of the spinach is critical to be sure your crespelle aren’t soggy. Once that’s done, head back to your crespelle batter. Put a small frying pan over medium high heat, and pour a small amount of oil in the pan. You’ll want to run over it with a paper towel to remove excess oil- you really want a thin film. Pour a small amount of batter into the pan and let it cook. After a few minutes, start to pull it away from the sides of the pan- when it starts to come loose you’ll be ready to flip. I flip carefully with my fingers. It’s easier than with a spatula! Keep making all of the crepes, until your batter is done. Fill each crepe with the filling, and roll up into the pan. Cover with tomato sauce, add a bit of grated cheese on top, and pop it into a 180c oven for about 30 minutes. 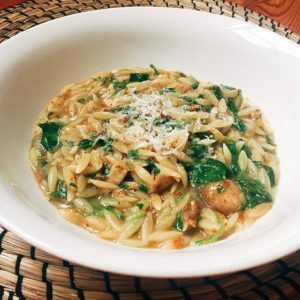 This is greek pasta cooked in a risotto style- constantly stirred adding bits of broth. The trick to getting it extra mushroomy is to blend dried mushrooms with their soaking liquid and alternative this with broth. First, put the dried mushrooms in a bowl and cover with boiling water. Let sit. Chop the garlic and the onions, and sauté it in olive oil, salt and pepper for about 3 minutes. 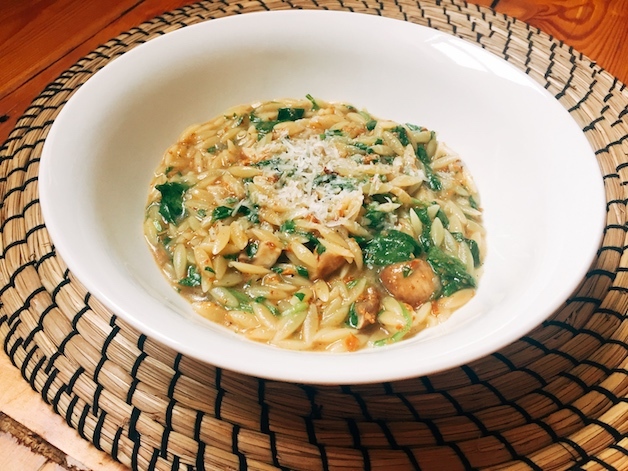 Once soft, add the orzo and toss it to ensure it’s coated in the olive oil. Let it toast a bit for a few minutes, then add the dried herbs. Toss again, then add the chopped mushrooms, and the sherry. Coat all of the pasta and let the sherry bubble away until it starts to evaporate. Add in a cup of broth at a time, and keep stirring (risotto style). In parallel, blend the dried mushrooms with their liquid in a blender, and start to alternate this mixture with the broth. Taste the pasta as you go along to test for doneness, and adjust the salt and pepper as you go. Once done, add in the spinach, stir until wilted, and pull off the heat. Top with grated parmesan and serve hot! This was one of the best meals of the year. This salad with fresh corn together with a pulled brisket (recipe coming shortly). A perfect fresh summer meal. Don’t do this with canned corn it just won’t be as delicious. Boil barley according to package directions, using a large stock pot. Brush corn with olive oil and grill on all sides until charred gill marks appear. Meanwhile, halve all of the tomatoes and rinse and drain beans. Cut kernels off the corn. As you cut, collect any of the “milk” that comes from the cutting process, then use the back of the knife to scrape the remaining “milk” from the cleaned cob. Next, cut the large tomato in half and grate with a box grater over a dish or wide bowl, discarding the skins, but collecting the juice and pulp. Paste the garlic clove by mincing the garlic, and then adding some salt and rubbing the mixture between your cutting board and the side of your chef’s knife. Add that paste into the tomato mixture. Add a pinch of salt, crushed red pepper to taste, vinegar, and corn milk. Always crush dried herbs in the palm of your hand before adding to release the oils…releasing oils = releasing flavor! Whisk in olive oil slowly. Your goal here is to create an emulsion. This should yield at least a ½ c. of vinaigrette. If you plan on making ahead, make ¼ c. of extra vinaigrette to freshen before serving. Reserve your vinaigrette. 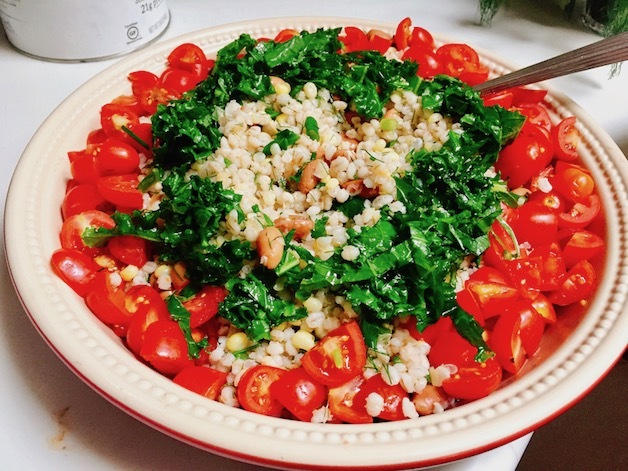 Combine barley, tomatoes, corn, beans and fresh herbs in a large bowl and dress with your tomato vinaigrette. Toss to combine. Finish with a drizzle of your best olive oil. We actually made this in the summer, as an easy recipe to make for a big hungry group. All the time is in the prep, which you can do several hours in advance, leaving you the rest of your day to sit back and enjoy with nothing to do except pop it in the oven. 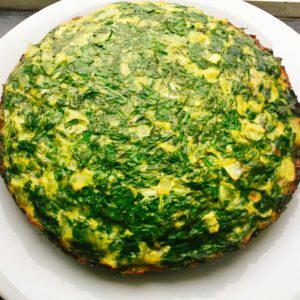 The key to it’s simplicity is frozen spinach, rather than wrestling with fresh. However, the flip side is that you need to squeeze it thoroughly (through cheesecloth) in order to remove all the moisture. The texture of your pie depends on it. Thoroughly drain the spinach of all water by squeezing it in a cheesecloth. Transfer to a large bowl and add dill, salt, pepper, eggs, cottage cheese, feta cheese, spinach, and olive oil. Fold ingredients together until fully combined, careful to not break up feta. Do not overmix. Now prepare the phyllo. Lightly butter a 9-inch by 13-inch baking dish. Prepare phyllo by removing from package and unfurling it. You should have around 25 to 30 sheets. As you work, cover the dough with a damp tea towel or moistened paper towel on top to prevent it from drying out. Carefully peel off one sheet of phyllo and lay it on the bottom of pan. Sheets of phyllo should not be pulled tight. Instead, lay it in a crumbled fashion to create a textured layer. With pastry brush, generously spread with clarified butter until the sheet is moistened. Continue until you have used half of your total filo dough (about 10 to 15 sheets). 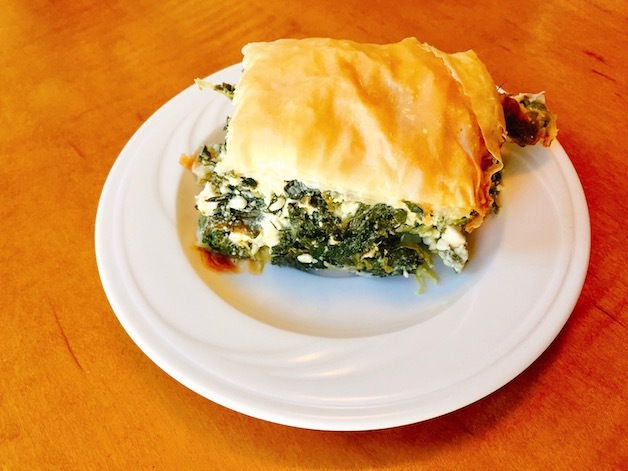 Spread filling over the sheets of phyllo in an even layer, to the ends of the dish. 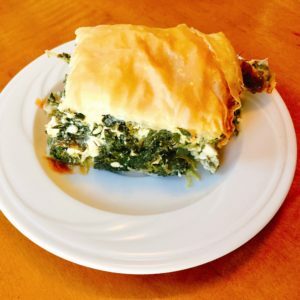 Begin the process of covering with phyllo and brushing with butter until two to three sheets of phyllo remain. Pull the final sheets tightly over the top of the dish to create a smooth top. Brush top layer with clarified butter. Bake at for 1 hour and 15 minutes, until the top is a deep golden brown. So this one Sunday evening I had the good fortune of running into my friend Vivs in the grocery store. I was determined to make chicken pot pies, I had spent all morning researching recipes for the week, and I had my grocery list prepared. Suddenly Vivs rocked my world, alerting me to the fact that the store had spaghetti squash in stock!! The list went straight into the pocket and I started from scratch. 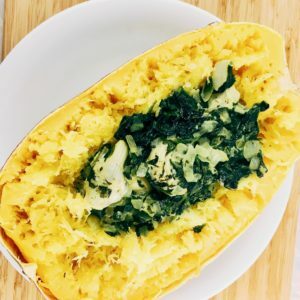 After some advice from Vivs (who made the squash a few days ago), and a quick google, I came up with this. Felix is thoroughly impressed and we’ve decided it’s going to be a repeated meal in the Breckhoven household! Cover your baking tray in aluminium foil, and place the two halves of spaghetti squash face down on the tray. Bake for 45 minutes, or until fork tender. While the squash is cooking, make your filling. Chop the two onions and the garlic, and sautée in olive oil or another vegetable oil, with a pinch of salt, until soft. Wash and chop up the spinach, and add it to the pan in batches until wilted. Keep salting to taste as you go along. Once cooked, add in the chopped artichokes and the sour cream, and stir until fully combined. Set aside OFF the heat. When the timer for the squash goes off, remove from the oven, pour off the water, and flip the squashes. Fluff the squash flesh with a fork, make a well in the middle, and add the filling (including the juices in the pan). 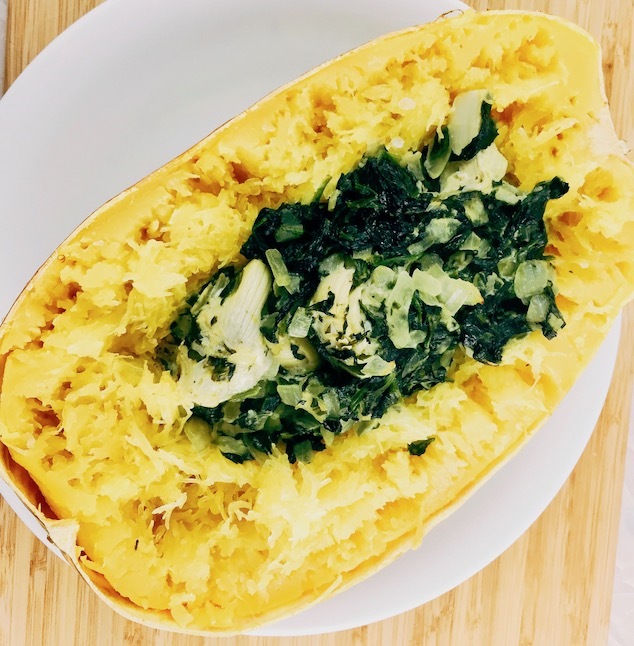 Drizzle with olive oil or add some small chunks of butter around the outsides of the squash, and sprinkle with more salt. Return to the oven closer to the top, and cook for another 10 minutes. Finish under the broiler for a few minutes. YUM. Thanks vivs for your inspiration! As I mentioned in the last post, I apologise for the visual repetition, I cooked these two dishes together on the same night. This recipe is the green daal pictured in the back of the photo. Its from the blog 101cookbooks by Heidi Swanson, and it’s been one of my standby recipes for years. It’s so easy to make, all you need is time (it takes about 2 hours in total, but really only 15 minutes of effort within that). Perfect for a dinner party because you can get it all on the stove, and let it bubble away while you pick up your mess. The recipe calls for white daal (urid daal), but to be honest I’ve made it with every kind of lentils over the years, and it’s always delicious. In a large pot over medium-high heat combine the daal and water. Bring to a boil, then add the spinach, ginger, turmeric, 3/4 of the green chiles, and all of the tomatoes. Reduce the heat, and simmer for 1 1/2 to 2 hours or until the lentils are extremely soft. You may need to add a bit more water during the cooking process to keep the lentils soupy. After an hour and a half, stir in the salt. In a separate pan, heat the butter and cumin and fry until the cumin seeds start to pop. Now add the red chile powder and fry for another 30 seconds. Add this butter mixture to the lentils and allow to cook for another five minutes. Taste, and season with more salt if needed. I also enjoyed a touch of lemon juice added at this point. Serve topped with the cilantro and the remaining green chiles. This recipe is from the genius Maunika Gowardhan, who is a really wonderful Indian chef. 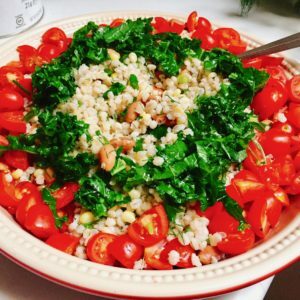 Her recipes are easy to follow, quick to make, and healthy. I think Indian is one of the cuisines in the world where meat is really necessary. The vegetarian options are so countless. The photo you see here is the same as the next post (Palaak Daal)- because I cooked them together, and I only took one picture #fail. So sorry for the visual repetition. Blend the ginger and garlic with a splash of water to a smooth paste and set aside. 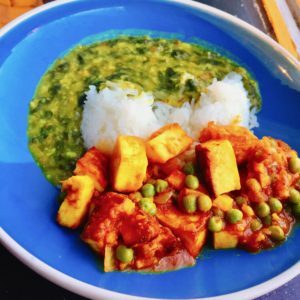 Dab any excess moisture from the paneer on kitchen paper and cut into bite size cubes. Add the cumin and coriander along with the turmeric and chilli powder. Fry for a minute and add a splash of water making sure it doesn’t stick to the bottom of the pan and continue cooking the raw flavour of the spices for a further minute. Tip in the blended tomatoes simmer the curry over a low heat for 8-10 minutes with lid on. Stir a couple of times through the cooking process. Add 200mls water along with the sugar and salt. Continue to simmer for 5 minutes with the lid on. Add frozen green peas along with the garam masala. 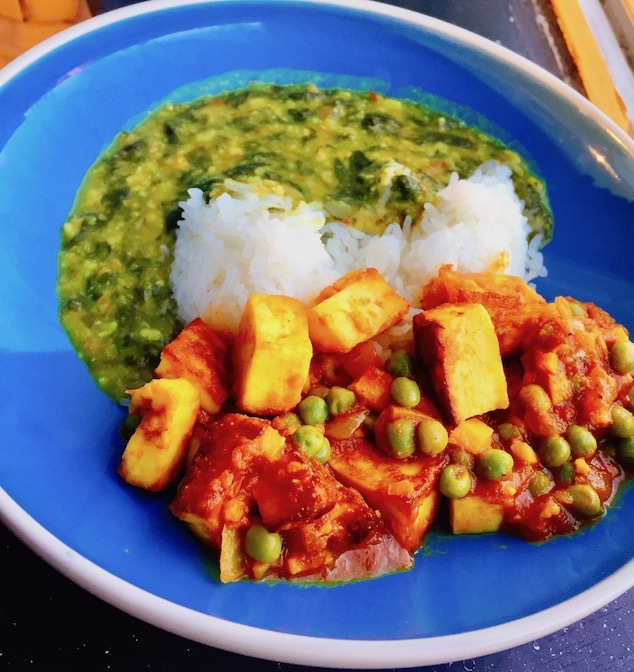 Drain the water from the paneer and add the cubes to the curry. Stir well making sure to coat all the pieces with the sauce. Simmer for 2 minutes and turn the heat off. Garnish with coriander and serve with rice. This is so herby and fresh, but filling. Great combined with a salad for a low (or rather NO) carb dinner! 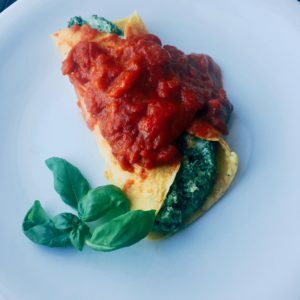 The original recipe comes from Bon Appetit (link in recipe card), and there is a video on the website that you can watch if you like to watch recipe videos. This dish is traditionally eaten on the Persian New Year, which you can read more about here. Apparently the new year is all about celebrating fresh herbs. Cheers to that, I love herbs! Heat 2 Tbsp. oil in a 10" skillet over medium. Cook onion and leek, stirring occasionally, until very soft but not brown, 10–12 minutes. Transfer to a plate and let cool. Wipe out skillet; set aside. Heat broiler. Heat remaining 3 Tbsp. oil in reserved skillet over medium. Pour in egg mixture; spread evenly across pan with spatula. 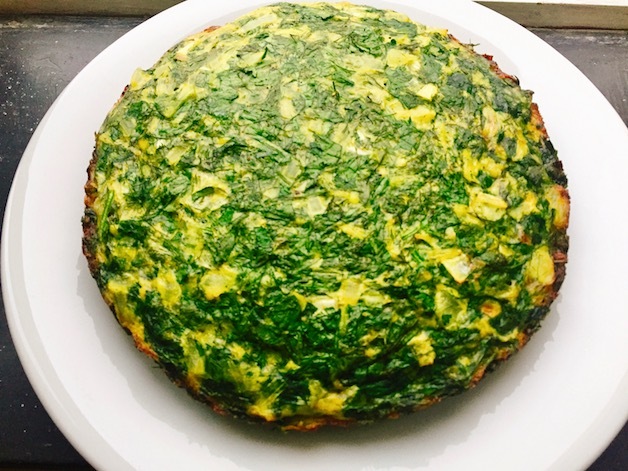 Cover and cook frittata until bottom is just set, 8–10 minutes. Uncover and broil, watching carefully, until top is set, about 1 minute. Let cool slightly, then slide out onto a platter.